The Orthodox Pocket Calendars and Planners are great for keeping quick notes while also reminding you of important feast days and fasting periods. Offered in both Old and New Calendar versions, they also features civil observances, liturgical readings and edifying quotes. The Orthodox Pocket Calendar is a month-at-a-glance calendar, full color, high quality booklet, which is conveniently sized to fit in your pocket or purse. It is offered in both Old and New Calendar versions. The Orthodox Pocket Planner is a week-at-a-glance calendar, full color, double-loop wire-bound, high quality booklet, which is conveniently sized to fit in your pocket or purse. It features liturgical readings for every day of the year. The 2012 Pocket Calendars are dedicated to the memory of Saint John, the Author of the "Ladder of Divine Ascent." 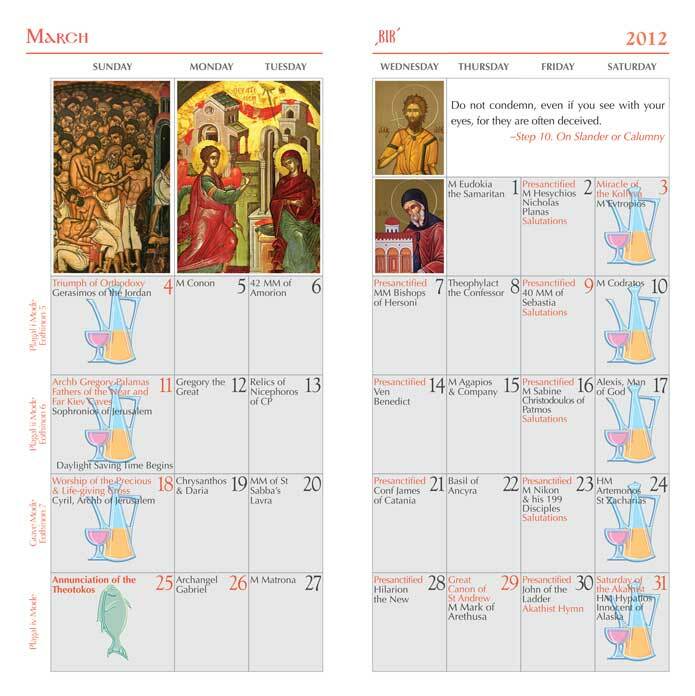 The Pocket Calendars & Planners are currently NOT in publcation For a similar Pocket Calendar you can contact the Holy Monastery of the Theotokos the Life-Giving Spring at (559) 338-3110.